« Thunderstorms Dump Hail on Thornton – More to Come? The National Weather Service has issued a Tornado Watch for much of northeastern Colorado including the Denver Metro area. Counties under the watch include Adams, Arapahoe, Denver, Douglas, Elbert, Kit Carson, Lincoln Logan, Morgan, Phillips, Sedgwick, Washington, Weld and Yuma. This watch is in effect until 8:00pm tonight. Tornado Watches are issued when weather conditions are favorable for the development of severe thunderstorms that are capable of producing tornadoes. A tornado watch therefore implies that it is also a severe thunderstorm watch. As we all saw two weeks ago in Weld County, conditions can quickly deteriorate and the weather can present a very real danger to life and property. 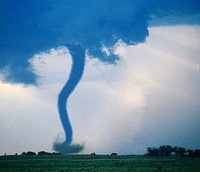 Now would be a good time to run through tornado emergency procedures in your mind. Please remember, should the tornado threat increase: Get in, get down and cover up! A well built structure with a basement is ideal shelter but if that is not available, an interior bathroom or closet is next best. Modular and mobile homes are NEVER a good option nor are vehicles. If you are in a vehicle and a tornado is near, abandon it immediately and seek shelter in a low lying area such as a ditch. For these and other tornado safety tips, please see our Severe Weather 101 – Tornadoes. This entry was posted on Wednesday, June 4th, 2008 at 1:56pm MDT and is filed under Colorado Weather, Severe Weather, Thornton Weather. You can follow any responses to this entry through the RSS 2.0 feed. You can skip to the end and leave a response. Pinging is currently not allowed.